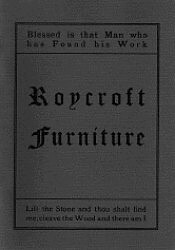 Roycroft furniture was not manufactured in large quantities. Nevertheless, it contributed significantly towards the growth of Arts and Crafts design in America. Furniture and other artifacts made by the Roycrofters at their community in East Aurora, New York, are easily identified by the incised orb and cross and/or �Roycroft� name. The 1906 catalog reprinted here depicts a substantial portion of the furniture designs produced under the forceful direction of Elbert Hubbard. The catalog also features some copper and wrought iron accessories. Softcover 52 pp, see below to order. This catalog includes handcrafted lamps, leaded glass lighting fixtures, and other metal objects produced by the Roycrofters at the beginning of the last century. 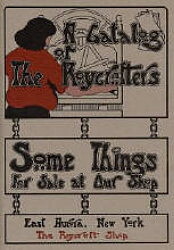 Featured are some of the earliest Roycroft forms designed by Dard Hunter and Karl Kipp. The influence of the Wiener Werkstatte can be seen in the clean geometric lines. The book is a compilation of material from The Fra, original trade catalogs, and contemporary photographs of pieces in private collections. Collectors will find this catalog reprint a valuable reference. The book also contains an Introduction by Ray Groll. Softcover 64 pp, see below to order.